Steve Stephens DFC personal account. This book is an account of my time in World War II when I was flying the Beaufighter aircraft as part of a squadron of South African Air Force seconded under the command of the RAF. The front cover is widely recognised as the most famous Beaufighter air-strike photo of WWII. It shows my plane attacking the Nazi-held medieval walled town of Zuzenberk. 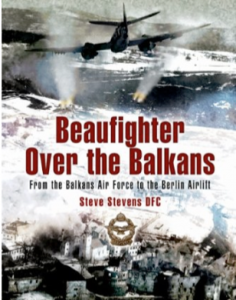 That attack by 8 of our 19 South African Air Force Beaufighter squadron resulted in the Yugoslav Partisans recapturing their town that very day.